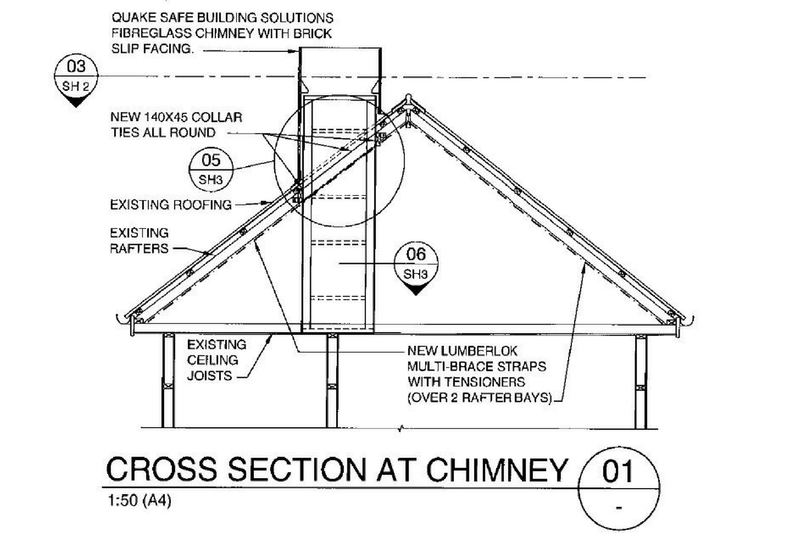 After experiencing the first big Christchurch earthquake in September 2010 and then spending the day clearing away our broken chimneys, we decided then and there to use our expertise to develop safe, secure and stunning chimneys for home owners in New Zealand. So, inspired from a desire to make buildings safer, we aim to help kiwis maintain the beauty of NZ heritage and architecture through innovation, technology and design. Building solutions that meet the rigors of modern building codes require innovation - a passing of the mantle. Using the expertise of a team of innovative individuals including composite specialists, roofers, builders, traditional old chimney builders, visual effects experts from the Lord of the Rings trilogy, engineers, resin chemists and honest business people – we have created a new way of doing things. Setting a benchmark for building, architecture, service and design. We work to help you achieve your vision for your home or building. Our unique fibreglass model is embraced by insurance companies, architects and heritage teams alike. Our quality, lightweight building solutions are ideal for restorations, renovations, new builds and earthquake repairs. Take a look at our range of stunning, safe and secure chimneys and architectural details. If I asked you what Lord of the Rings, Waveski’s and Quakesafe chimneys have in common would you know? Well it’s Nick! An expert in composite design and manufacture, Nick honed his craft working at designing and manufacturing waveskis, snowboards and skis. When you love surfing and skiing – what better thing to do? His Tsunami waveskis have largely been in the final of the world championships most years since the brand launched. Nick also helped build the original Britten motorcycle – designing and manufacturing fairings. Nick remembers fondly working all night on the Britten motorbike with John for urgent race day repairs. A true craftsman, he then turned his hand to the film industry developing sets and designs for the Lord of the Rings Trilogy. Nick was Head of Design for the Rock and Foam department. So after the Christchurch earthquakes struck, Nick knew he could turn his hand to helping people rebuild. Always the perfectionist, Nick worked to create a composite model chimney design that was not only safe and secure, but also beautiful. So out of disaster, Nick developed a unique way to create an exact visual replication of original and heritage chimneys. His patented designs are 90% lighter than standard chimney weights and are completely Quakesafe. Nick’s desire to solve problems, attention to detail and rare skill set has seen him literally change New Zealand skylines for the better. Outside of Red Mantle, Nick loves to surf and design, and is looking forward getting back into hang gliding one day soon! Nick also loves working with people and enjoys finding the best solution for his clients. So if you need expert assistance with your project, Nick is your man! Nat is the heart and soul of our business. A Marine Scientist by trade, Nat has her PhD in Marine Science, specialising in Fish Ecology. Many a day has been spent by Nat, chasing snapper and blue cod all round NZ to gain a better understanding of their life cycle and habitats. Although no longer an active scientist, Nat’s passion for marine life and conservation remains. And it is this same caring nature and desire to help that brought her to Red Mantle. After the first Christchurch earthquake, her partner Nick knew he could help with the rebuild. Seeing the vision he had to retain the beauty of homes and buildings was exciting. And so, Nat jumped right in with Nick, to work towards developing safe and beautiful chimneys for homes throughout New Zealand. Now, as a Company Director and Office Manager, Nat wears many hats. She finds herself working across almost every project and giving her clients the care and attention for which she is known. Solving problems, navigating a course, protecting a home – not that different from Marine Science is it? Nat says her time is spent differently these days, but nothing can compare to seeing her clients realise their vision for their homes. Outside the workplace, Nat loves to dive, travel, spin cycle, watch good movies and read. In fact, Nat was recently part of a group of 13 people who set a world record spin biking for 25 hours straight! So, you can imagine that climbing the scaffolding to inspect a chimney is a piece of cake for Nat! Strong and caring - just the kind of person we love having on our team. Brent spent many years as a seaman on coastal shipping routes delivering fuel and other supplies to New Zealand and abroad. He got into building when he decided to build his first house in Waitakere, West Auckland and found he had a bit of a talent for the trade. With an eye for detail and the ability to think outside the square, Brent has continued building his own houses and working in the industry for the last 25 years. A great partner and friend to Red Mantle, Brent provided building expertise and guidance in the development of our patented chimney designs. Brent helped design, build and install our first composite chimney for a home in Redcliffs, Christchurch. He also helped develop and install our first ever Brick-Slip design on the Hunting Lodge in Huapai, Auckland. Brent is now semi-retired except for his house build projects and occasionally when we need his skill and advice. Mostly nowadays, you can find Brent on his yacht in Auckland sailing towards the Hauraki Gulf or Great Barrier Island. Recently, Brent helped a couple to sail their boat to Tonga. Nice aye! We work with homeowners and contractors and their insurance companies, architects, engineers, builders, local council and heritage teams. Whether you are dealing with a damaged chimney, want to replace your chimney with a lightweight alternative or building new, we can work with you. Contact us for more information about our stunning, safe and secure chimneys and architectural details.